Definition at line 144 of file llmultigesture.h. Definition at line 243 of file llmultigesture.cpp. Definition at line 250 of file llmultigesture.cpp. Definition at line 278 of file llmultigesture.cpp. References mAnimAssetID, mAnimName, mFlags, TRUE, LLDataPacker::unpackString(), LLDataPacker::unpackU32(), and LLDataPacker::unpackUUID(). 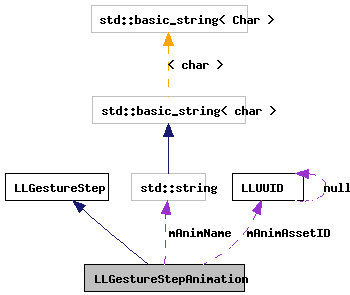 Definition at line 310 of file llmultigesture.cpp. References llendl, llinfos, mAnimAssetID, mAnimName, and mFlags. Definition at line 295 of file llmultigesture.cpp. References ANIM_FLAG_STOP, mAnimName, and mFlags. Definition at line 253 of file llmultigesture.cpp. Definition at line 150 of file llmultigesture.h. Definition at line 270 of file llmultigesture.cpp. References mAnimAssetID, mAnimName, mFlags, LLDataPacker::packString(), LLDataPacker::packU32(), LLDataPacker::packUUID(), and TRUE. Definition at line 162 of file llmultigesture.h. Referenced by deserialize(), dump(), LLPreviewGesture::handleDragAndDrop(), LLPreviewGesture::initDefaultGesture(), LLPreviewGesture::refresh(), and serialize(). Definition at line 161 of file llmultigesture.h. Referenced by deserialize(), dump(), getLabel(), LLPreviewGesture::handleDragAndDrop(), LLPreviewGesture::initDefaultGesture(), and serialize(). Definition at line 163 of file llmultigesture.h. Referenced by deserialize(), dump(), getLabel(), LLPreviewGesture::refresh(), and serialize().